Click here for a 360' IPIX Virtual Room Tour. 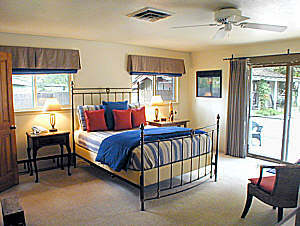 Our most light-filled room, the Mesa’s queen-size iron bed is covered in denim and soft southwest design. The room offers a private bath, small television with VCR, access to video library, wireless internet, in-room telephone and a small refrigerator.